Summertime is here!! 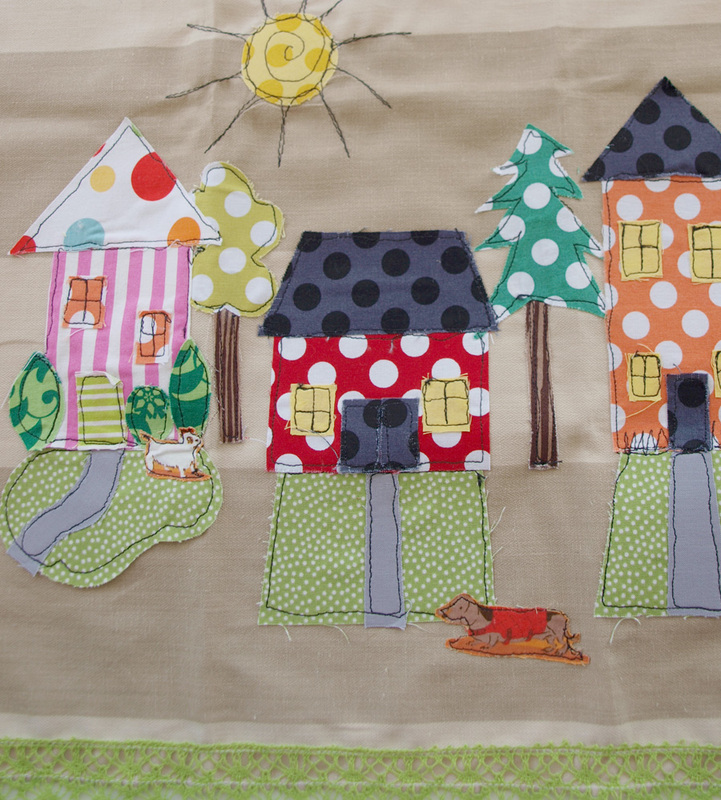 We love sewing in the summer. So many cute skirts, dresses and tops to make and wear while playing games in the park, riding bikes, or picnicking. 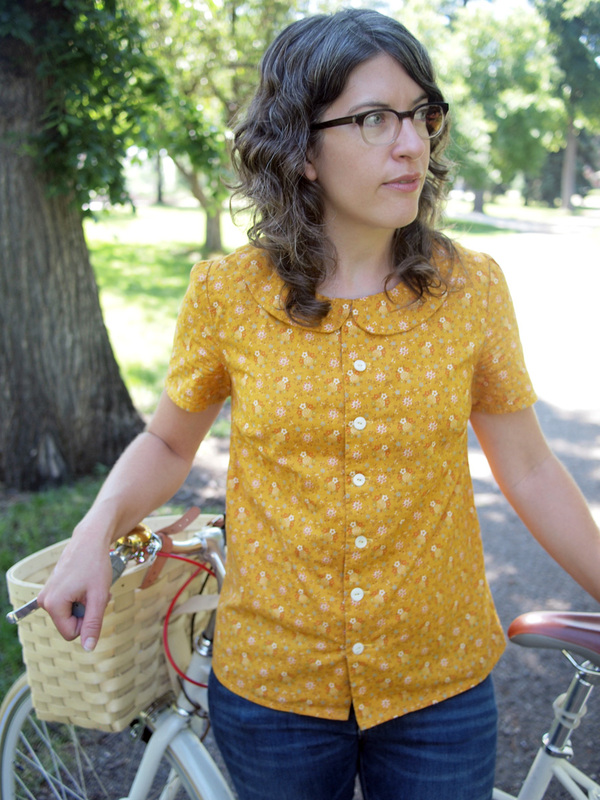 We are really inspired by the newest shirt pattern from Colette, the Violet. 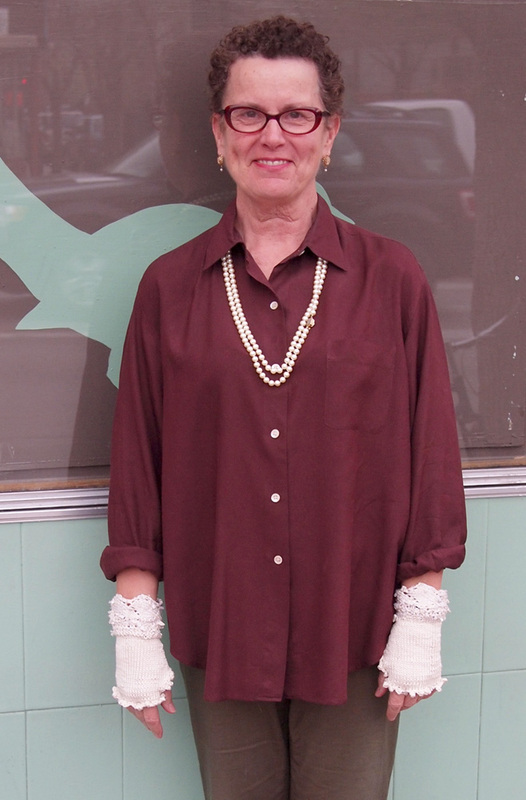 It is a simple and stylish button-down blouse that can be made with short sleeves or a puffy 3/4 sleeve. 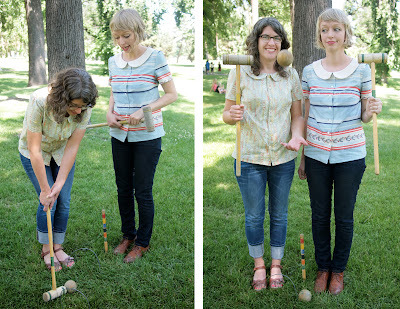 I've already made two of these cute shirts--I love the Violet pattern so much! My first was made in a My Folklore print by Lecien. 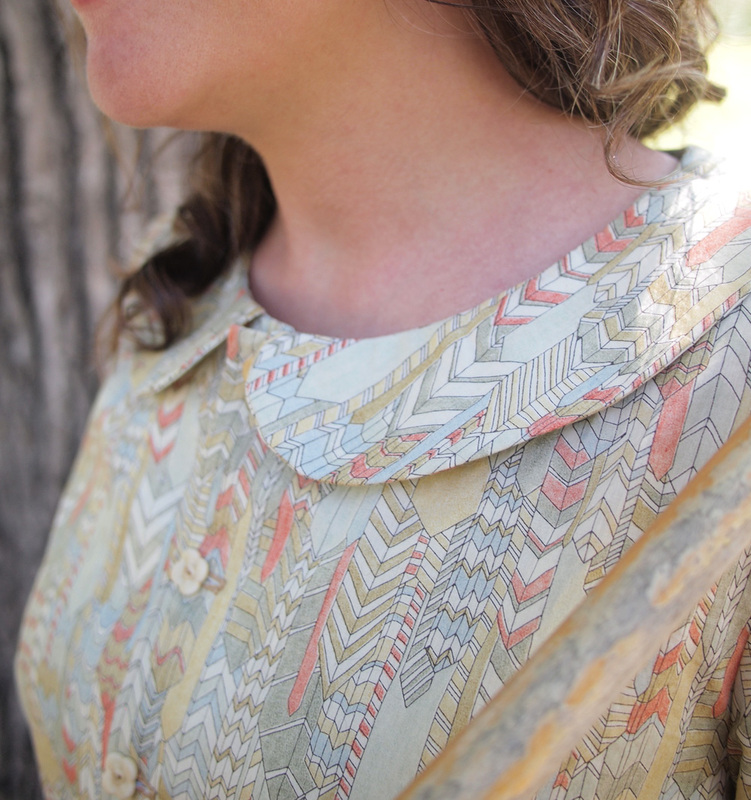 The sweet and small floral design and the burnt gold color give this blouse a vintage French feel. Slightly mismatched shell buttons add some unique character. Once I knew I loved the fit of my first Violet top, I decided to splurge and make one out of a Liberty of London fabric. I've had my eye on this graphic print for a while and the lightweight lawn fabric is perfect for this shirt. Sweet little cream corozo flower buttons lend a feminine touch. I love it! On a recent trip to Portland I visited the adorable fabric shop, Bolt. I had fun meeting Gina, the sweet shop owner, and spent the afternoon perusing their fabrics and seeing both familiar fabrics and fabrics that I hadn't seen before. 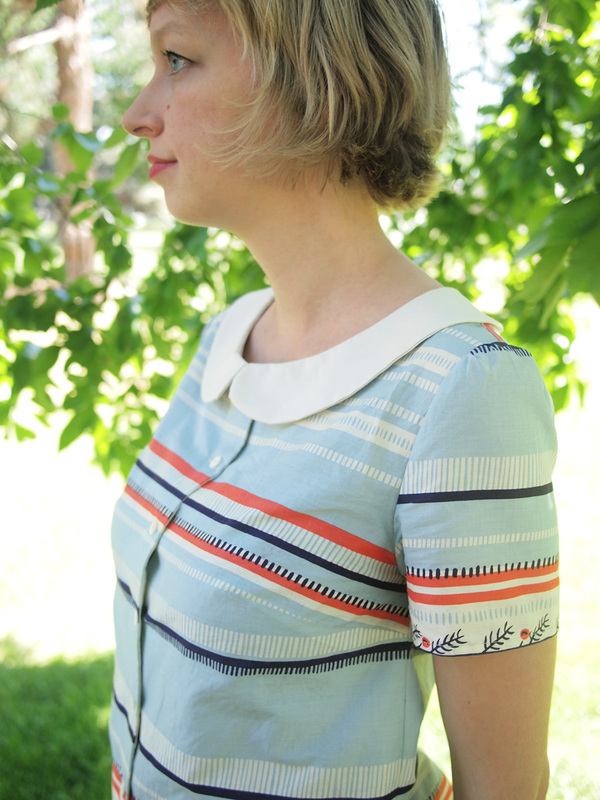 I fell head over heels for this Yuwa print in coral, cream and blues--and when I brought it home decided it would make an adorable Violet. 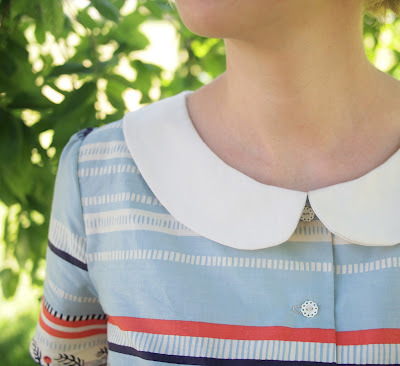 My favorite thing about this button-down is the darling Peter Pan collar. I chose an ivory Kona cotton for the collar and skipped the interfacing--the quilting weight cotton is heavy enough that you don't need it. Seven sweet mother of pearl eyelet buttons finish it off adorably! This light weight blouse is perfect for a day of croquet in the park! New Tula Pink Prince Charming Fabrics! Ms. Pink did it again! 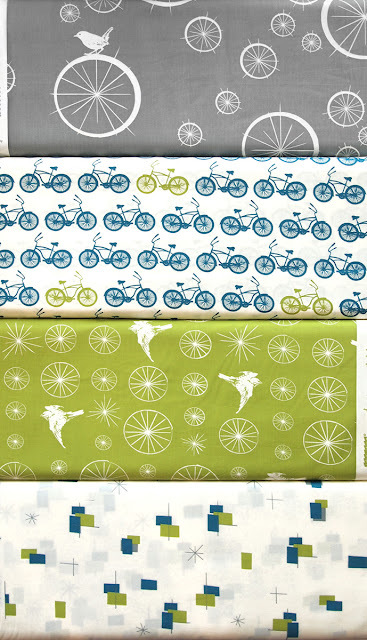 Tula Pink's new Prince Charming fabric collection is incredible. We love her fresh color scheme and totally modern take on classic toiles and damasks. 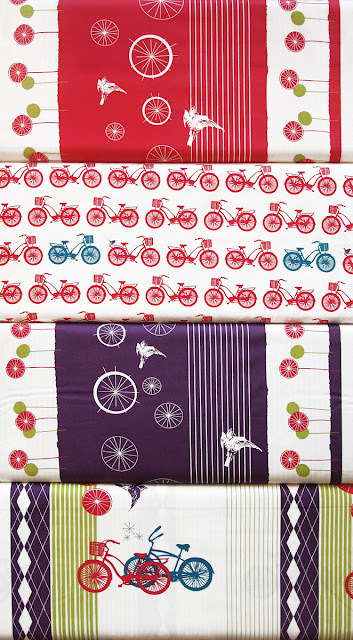 The collection includes quilting cottons, voiles and laminates, so anything you dream up--from summery voile garments to waterproof totes or bright quilts--anything can be made from these cute prints! 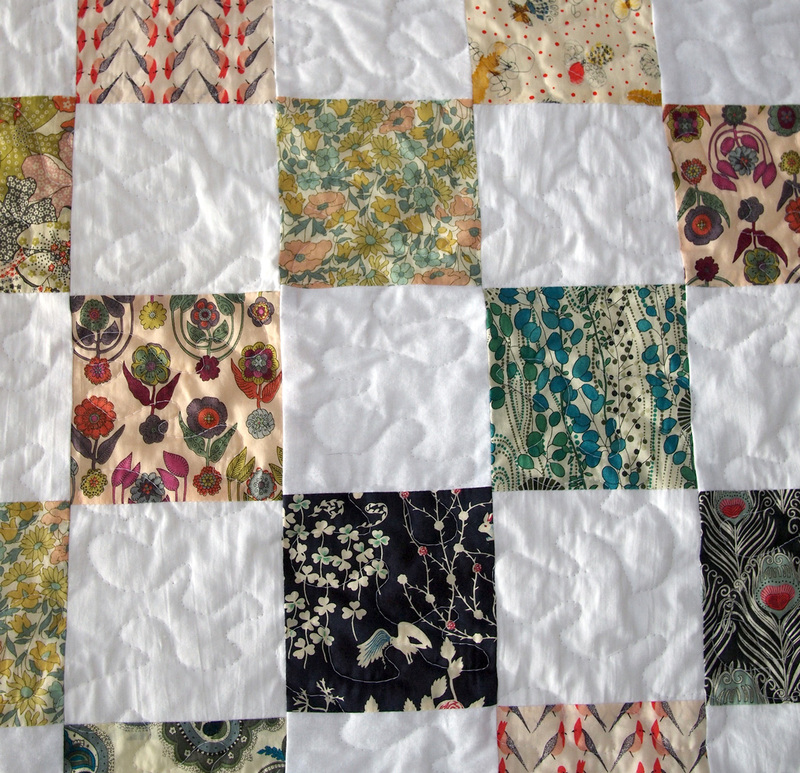 We gasped with delight when Mary walked in with this fresh-off-her-sewing-machine Liberty quilt. 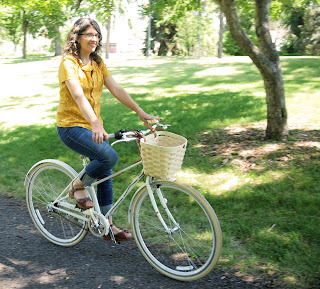 We love it to the max, and really, how could you go wrong with a sweet checkerboard of pretty Liberty prints on white? 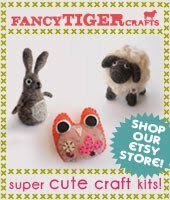 What makes you such a crafty lady? I am a pharmacist and I craft for fun. 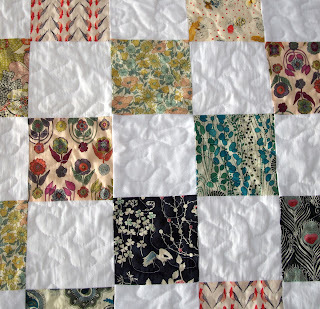 What inspired you to make this Liberty quilt? My husband heard me talking about Liberty fabric and he surprised me with some as a gift. 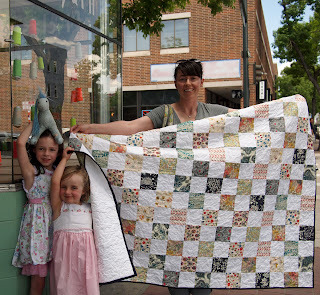 I started quilting when I had my daughters. I took a 7th grade Home Ec class and then I asked a lot of questions of a coworker and fellow quilter. 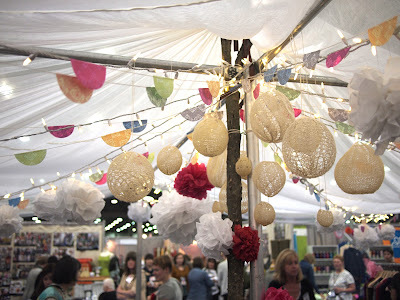 We had a blast at the TNNA trade show in Columbus! 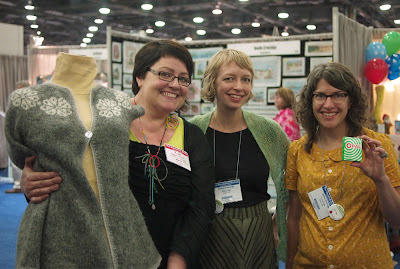 We picked up exciting new things: yarns and patterns, buttons, books, spinning fibers and felt. It's going to be a fantastically inspiring fall around here! Our vote for cutest booth of all time goes to Ysolda, who decked out her space with a tea party, treats and photo booth funtimes. We stopped for a refreshing cup of Earl Grey and got to try on knit samples and peruse copies of her soon-to-be-arriving book Little Red in the City. We think you are going to love this book. 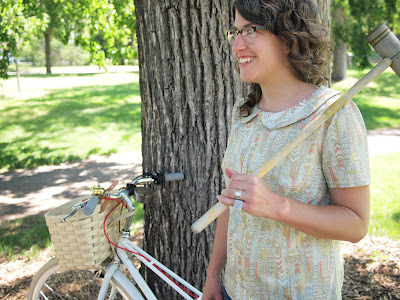 She really gets nerdy about knitting and in the most fabulous way. We asked you on Facebook which new sock yarn to pick up and folks chose Anzula! Here is the hottness that is Anzula Squishy. We love the super saturated colors of this semisolid hand-dyed merino/cashmere. Can you handle the fabulous throw that was in Anzula's booth? 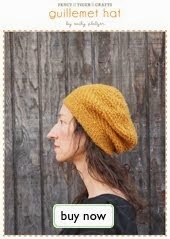 It reminds us of this one from the Purl Bee, which is also made out of Anzula Squishy...yum. 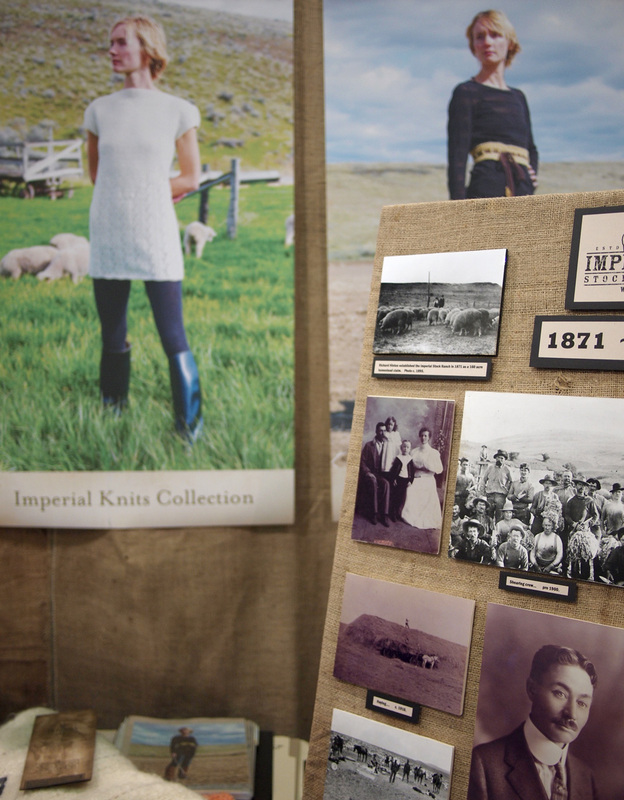 Hooray for 140 years of Imperial Stock Ranch! 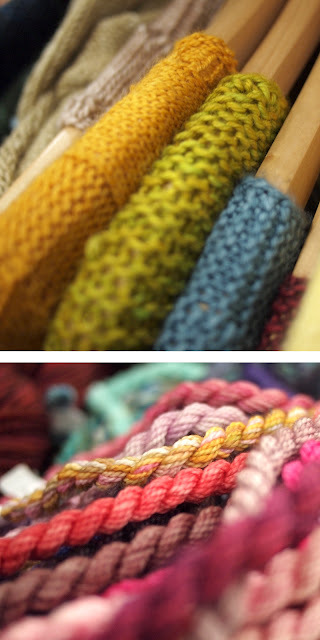 We have a major crush on this yarn company. At TNNA we raised a glass to celebrate their anniversary and got to indulge ourselves on chocolates. 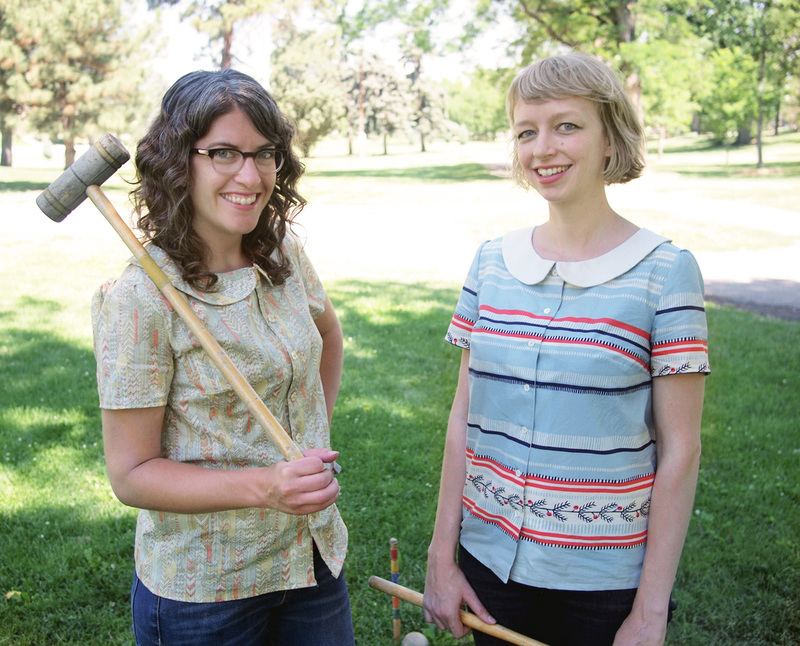 We picked up another yarn from their line, Tracie Sport. 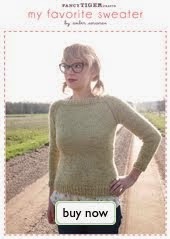 It is a fabulous tweedy sport weight yarn, made from 100% Columbia wool from the Imperial Stock Ranch in Oregon. 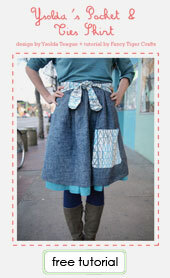 Fantastic new patterns are on the way, too, including these knee-high socks! 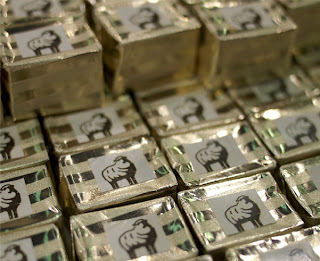 Chocolates wrapped in the cutest Columbia sheep packaging...Happy 140th, Imperial Stock! Ragga! 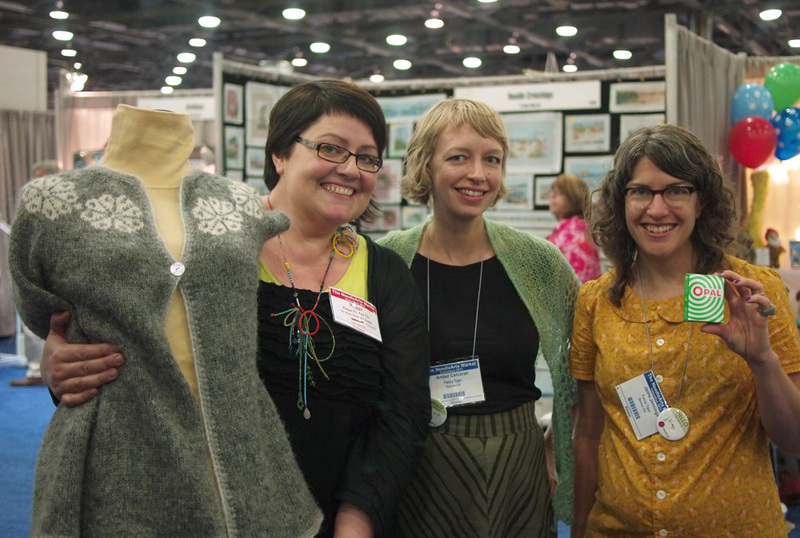 We love this Icelandic knitting superstar! You may remember Ragga from our epic knitting trip to Iceland last fall. Ragga hosts amazing tours of Iceland (you should book one right now) and has recently published Knit Your Own Lopapeysa, a DVD tutorial on traditional Icelandic sweater knitting, which you can purchase at Fancy Tiger if you can't join her in Iceland. Ragga is sweet as pie and brought us presents--an awesome traditional Icelandic shawl book that I've been hankerin' for and some of the weird salty licorice candy Jaime got hooked on while visiting Iceland. Ragga, we love you. We can't get enough of Knit Collage. 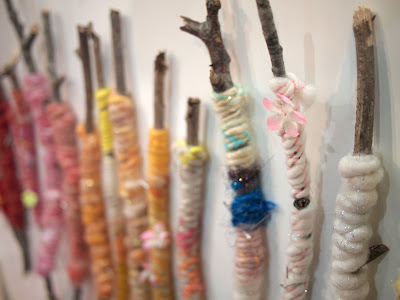 Are these yarn wrapped twigs the cutest thing or what? FYI, new colors are coming this fall. Eeeeep. We've got lots more surprises in store for fall, so stay tuned for exciting new things! 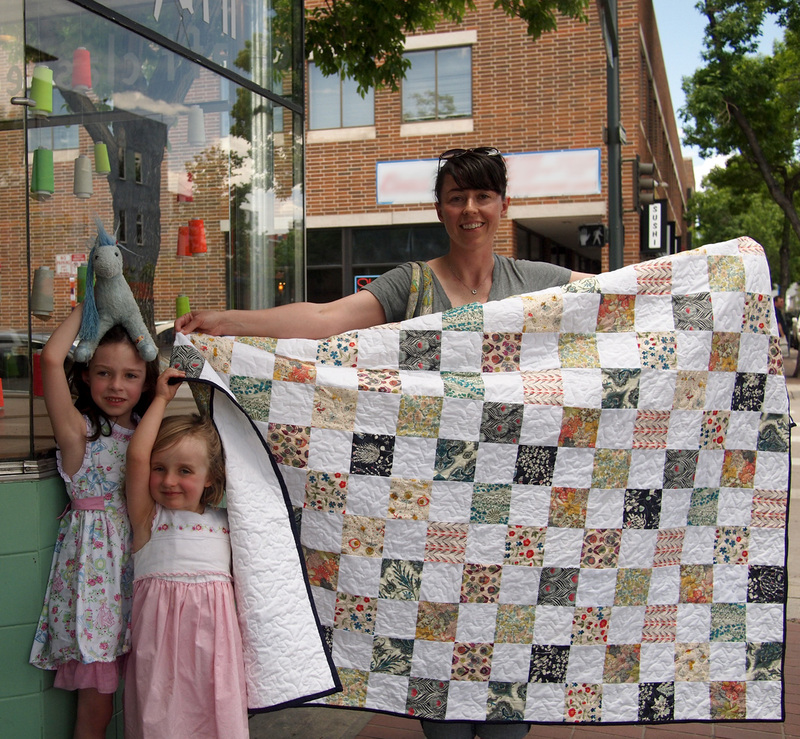 We love the quilt that Rhiannon brought by to show us. She just finished stitching up this pretty cross-stitched butterfly quilt and backed it with a bright orange sprout fabric. 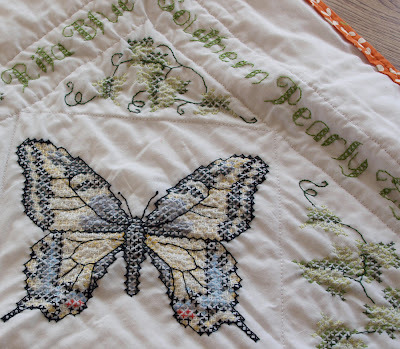 The detail of the front of her quilt is inspiring--we don't often see a quilt with this much intricate hand-stitching. Nice work, Rhiannon! 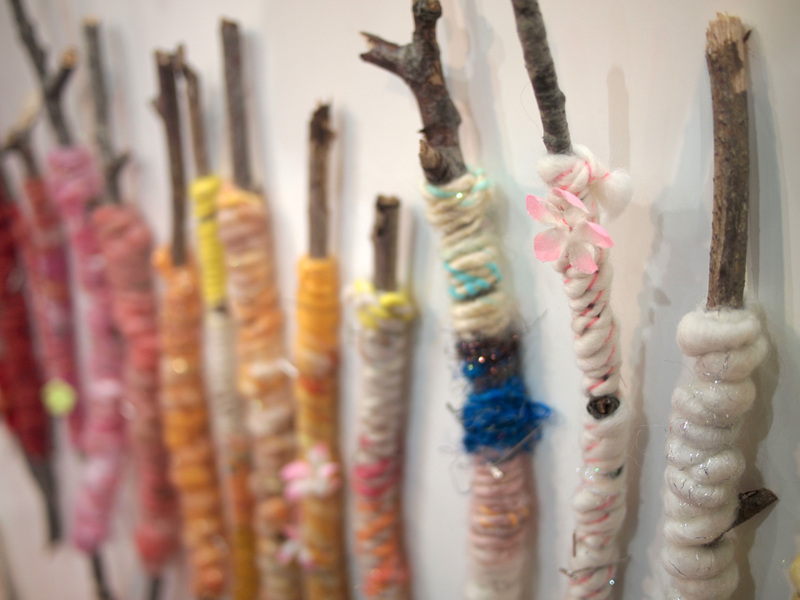 Tell us about how you got to be so crafty. My grandmother taught me how to do all different crafts. I still, after 20 years, enjoy it. 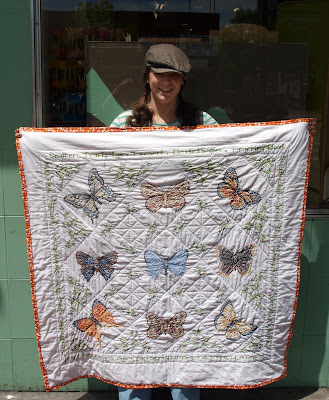 How did you make your butterfly quilt? I used a cross stitch/quilting pattern. New Bling-tastic Stargazer Silk & Sequins Yarn by Knit Collage! We love the amazing-ness that is Knit Collage--a handspun art yarn company by Amy Small. 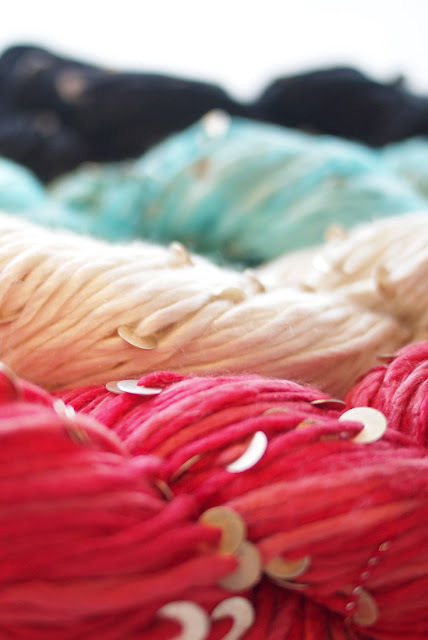 We are enamored with her newest yarn, Stargazer Silk. This is a gorgeous 100% silk yarn beaded with brass sequins. That's right, folks, this bling is metal. No cheesy plastic sequins for this luscious yarn. 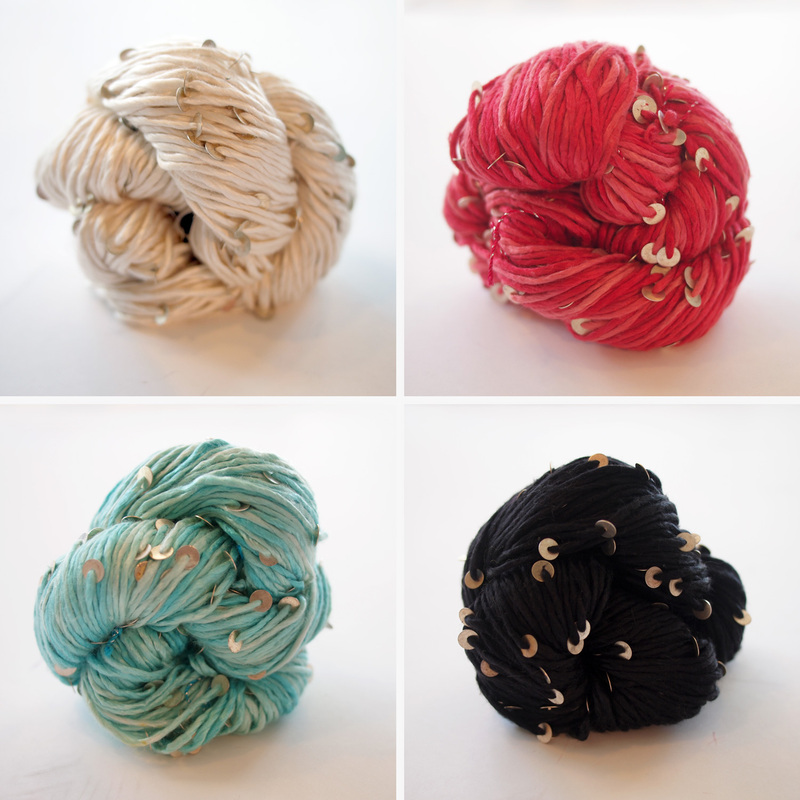 Stargazer Silk comes in 4 fancy colors - they are each beautiful on their own or will work together wonderfully. This is the perfect yarn for luxurious summer time projects - think drapey open shells to wear for an evening out or a light summertime scarf. Marilyn recently picked up knitting after a 45 year hiatus. She amazed us with these fancy Victorian style fingerless gloves which she embellished by adding Zing String, a sparkly thread of beads and gemstones, into the lace cuff. 1) Tell us about yourself, Marilyn. I am a retired university librarian. I make handmade books filled with paintings, collages, etc. You can see my work here. 2) Tell us about the fancy fingerless gloves you've made. 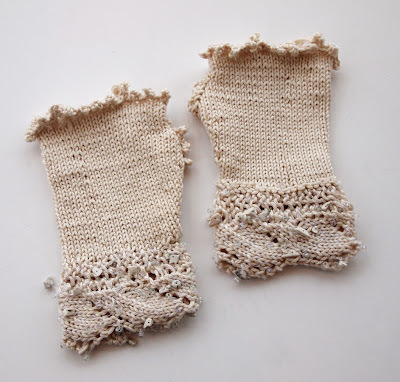 I knitted Victorian fingerless gloves and added Zing String to embellish the lace cuffs. 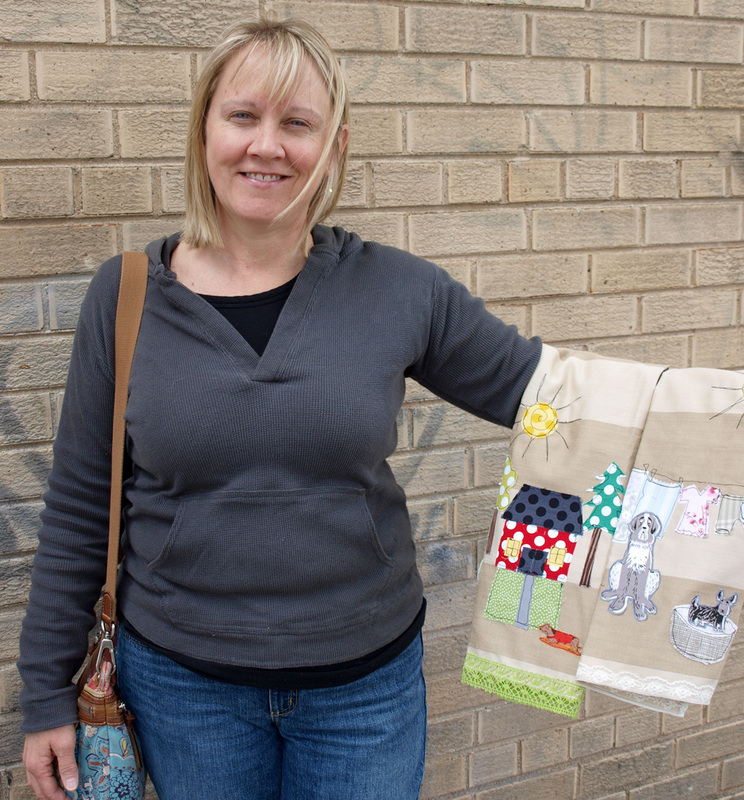 3) How did you pick up your crafty skills? I learned to knit at age 12 and continued until I was 25. I stopped knitting for 45 years and started again in late 2010. Thanks Marilyn! 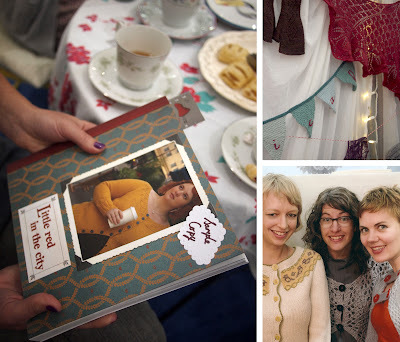 Happy knitting and bookmaking! New! Avalon Organic Prints by Birch Fabrics! 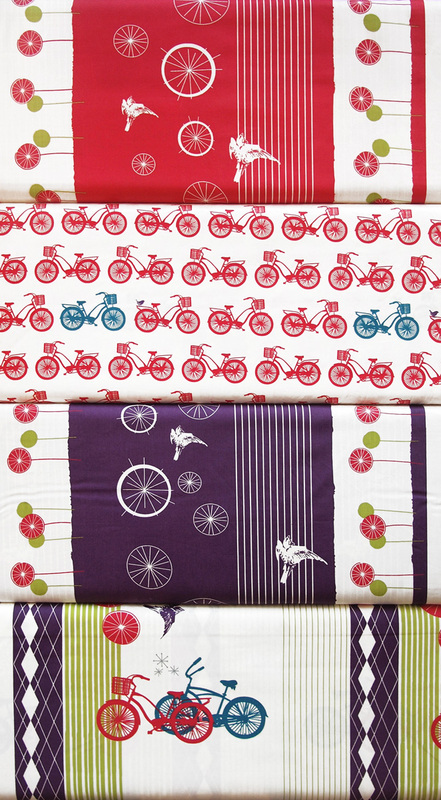 Avalon is here, the highly anticipated organic line from Birch Fabrics! Avalon features totally rad cruiser bicycles and birds perched atop bike seats and wheels.It is a light cotton organic fabric and is bright white with saturated color pops of summery teal, lime, cherry and grape. Yum. We are super lucky--we entered to win this little quilt at the Birch Fabric booth at Quilt Market trade show and just found out we are the big winners! 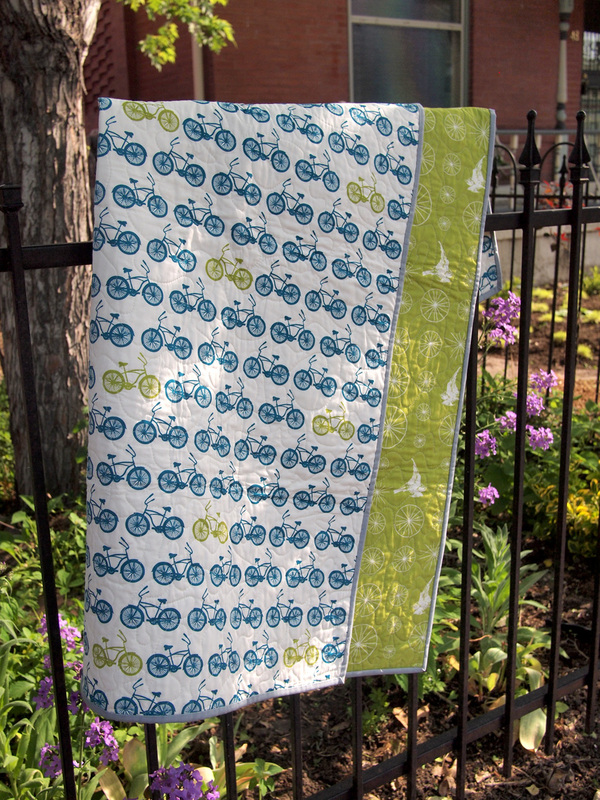 You can make your own cute bike quilt with just a yard each of the bicycle print and the birds and wheels print. 1) Tell us how you got to be so crafty. 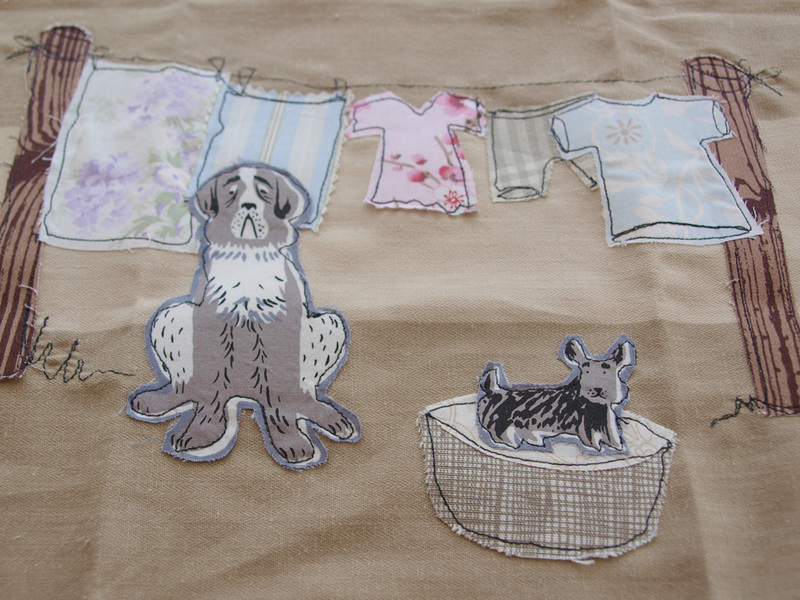 2) How did you make your tea towels? 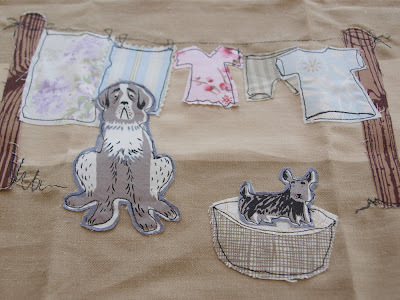 I used to make collages to hang on my wall and this reminds me so much of what I'm doing now with fabric scrap applique. There is also the "drawing" element--using the free motion setting to draw with thread. 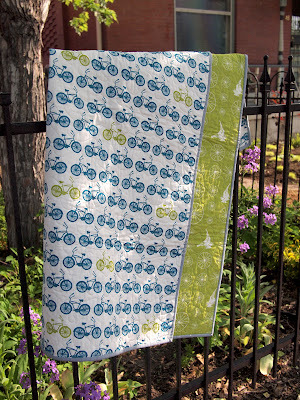 The tea towels were inspired by Anthropologie towels. I used a French General woven twill for the towel fabric. Even the backs of these towels are fantastic! My mother mostly taught me to sew. When I was 10, she sent my sister and I to the neighborhood sewing lady for lessons. 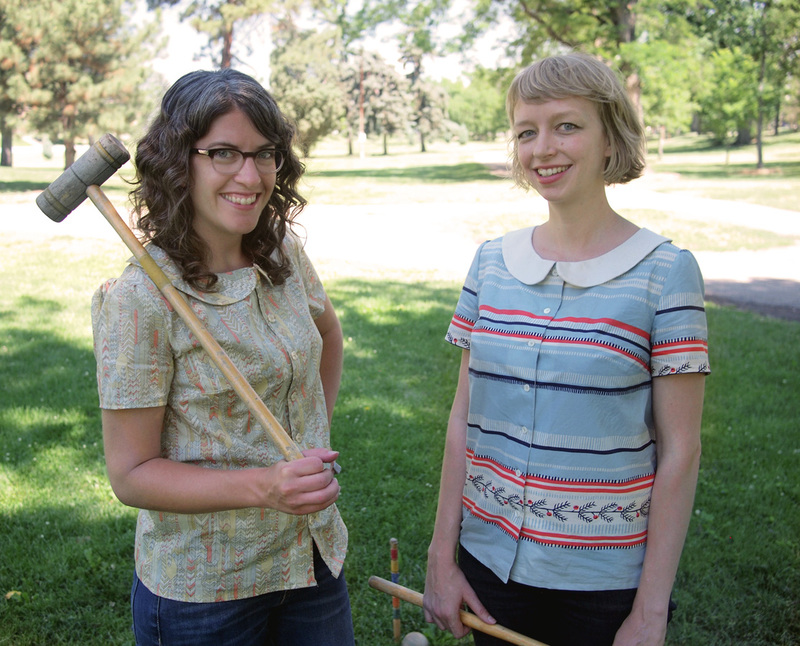 I made a tennis dress and sewed a lot of clothes through the years. My mother made a lot of our formal dresses, three girls, for proms and even a few in college. I love all animals but I'm partial to pups!